The Doctor is, once again, in. Boulder is possibly worse than Aspen as a place to go dirtbag. The county parks are extremely camping-unfriendly, as is the city itself, and the closest legal camping, in the national forest west of town, is a long drive away from the Flatiron trailheads. It seems possible to sleep in the pullouts along the roads behind town if you get there late and leave early, but it’s not exactly peaceful, and you risk being pestered. At least gas isn’t overpriced. The flatirons, however, are a great place to solo, with many long routes in the 4th-5.6 range, most having reasonably short approaches. Even though it’s winter in the mountains, it is still fall down in the foothills. I wasn’t sure what to expect of the climbing: I hadn’t been on rock in awhile, and soloing slab can be nerve-wracking when balancing on small nubs above a long, slow, cheese-grater death. While I knew that “class 3” in Colorado means you probably won’t have to use your hands, I didn’t know how their 5.x routes compare to those elsewhere. 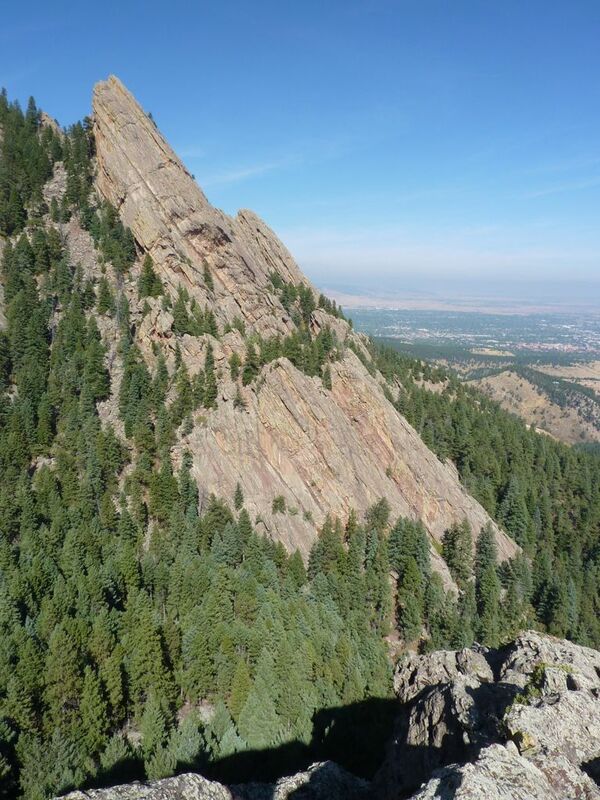 So I started with some mellow routes in the 5.0-5.3 range, all close together near the southern end of the flatirons. The Slab is an impressive wall, both tall and broad, with a rippling, varied surface that lets you choose your level of difficulty. Trying to make it easier, though, may require careful route-finding. After a leisurely 20-30 minute approach along a well-maintained trail, I started up at what seemed like a reasonable place based on the wall itself and the trampled ferns. I was shaky at first, being rusty and on unfamiliar rock, but I soon got into the groove and became familiar with the two kinds of rock (slicker red and more featureful gray). The route is impossible to describe — I just wandered back and forth up the face, avoiding the bulges and looking for cracks and more featureful areas. A more direct approach would have been a challenge, but with some meandering and minor backtracking, I managed to keep it mellow. Water pockets supplied enough positive holds that I was rarely gripping nubs with my fingers, and there were even some ledges as wide as my foot. I finished by stemming up a crack, then boosting to the left to reach the summit ridge, a broad plateau covered with potholes. From there it was a long, mostly-easy scramble south to the summit, with plenty of opportunities to escape off the back. This is not always the case: it can be surprising here to reach the top of a long, mellow slab, only to find a 20-foot overhang on its uphill side. I scrambled a short pitch to the summit, then sat and ate my fish, watching a flock of hawks or falcons playing in the updrafts. A couple flew no more than 20 feet directly overhead, but I wasn’t fast enough with the camera to get a picture. Since the guide said to descend to the south, and the Keel, my next objective, was in that direction, I bumbled down a steep, wooded gully, eventually finding a use trail at the bottom. After wasting much time going back and forth looking for the base of the Keel in the thick woods, I picked my way past some poison ivy and bumbled onto it from behind about 40 feet up. The Keel was disappointing, rarely requiring more than 0 or 1 hands, and usually offering an easy escape into the woods to the north. Tragically, the summit was overhanging to the north and west, but it was easy to backtrack a bit and dismount to the south. The north Devil’s Wing was only 5th class if you made it so. While it looked entirely possible to follow the fat, tree-filled cracks to the top, I tried to spice things up a bit and stay on the slabs. The hardest part was probably the walk-off, with a choice of horrible downed-tree bush-whacking or wet-lichen-covered talus. Either way, I ended up using my hands almost as much on the way down as on the way up. Top of the Slab, with potholes. Looking south, to pinnacles and haze. Seed pod and pot holes were my favorite photos. Fun to read your descriptions again.